Installing all the components in a large case like the MasterCase H500 is a nice experience. It is always difficult to fit cables through small holes and to plug in tiny connectors with little room. For the most part, the MasterCase H500 creates an easy to build in environment. The front panel pops off easily, but the 200mm fans need to be uninstalled before a radiator is able to be installed on the inside of the case. This is a minor annoyance, but definitely gets in the way on a first installation. 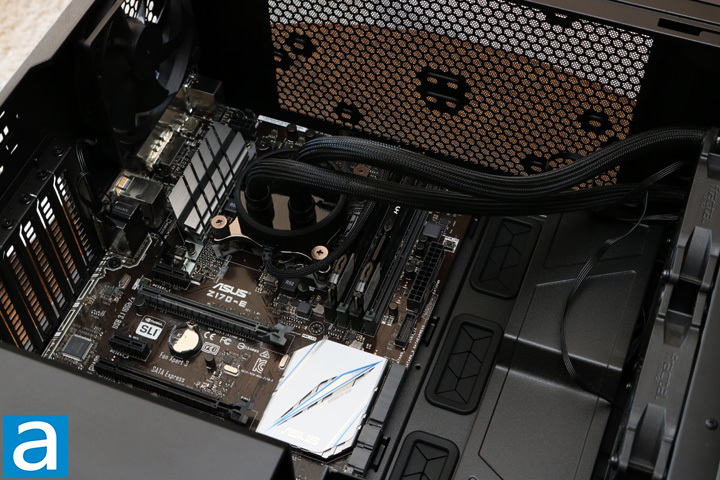 When it comes to the rest of the components, the motherboard easily slots into place after installing the necessary standoffs. The expansion slots can be quickly removed and reinstalled if necessary, ensuring any PCIe cards can be installed and even replaced in the future. As for the power supply, the entire shroud needs to be removed to mount the power supply. Even though it is a bit more of a hassle removing the shroud, it definitely makes the whole process easier. Having all that extra room to just move the cables around instead of just guiding them through a hole is excellent. When it comes to the back of the MasterCase H500, we do find the required ingredients to properly clean up all the cables. Unfortunately, I am not very good at that, and I mostly just tied down and grouped cables together in a weak effort to make it look nice. Most of the cables are easily routed around to their required destination, however, the drive cages are a little tricky. The hole at the back of the cages is not very large, making it impossible to fit one's hand through to the drives. This means all the cabling needs to be routed through before a drive is installed and then connected without the drive on the rails. After plugging everything in, the whole thing can slide back into the cage. After some fiddling, I was finally able to do that. Cooler Master's manual is lacking in some instructions, especially when it comes to the RGB light controller. There are pictures of what is included and which screws to use, which is good, but there is absolutely no explanation of how it works. I had to play around a bit before I was finally able to figure out how to plug it all in. For the most part, the installation is smooth, but there are some frustrating design choices that make it more of an ordeal. You know if the RGB colors actually lined up, I would have really liked the final look. The RGB implementation is not very good. One either connects the reset switch or keep the controller inside of the case, both of which are not ideal. Furthermore, the colors do not sync up, which is why I have two different colored fans. For quite a few of the colors, only the top fan LEDs worked while the bottom fan did not light up. It seems like there is a nice range of colors to choose from, but I have no idea how many different lighting modes there are. Unlike other RGB cases, I literally have no idea when my fans will change color or remain static. Often I would stumble upon a nice color that I would keep, when all of a sudden the colors would change. I would much rather not have RGB, especially after struggling to figure out how it works for so long to not even have the fans be the same color. However, I concede that I might have a faulty LED controller, and definitely a faulty fan that does not show off all the colors, but this is still disappointing. The fans are also a little loud. I turned down the fan speeds, but still they make more noise than I would like. On a scale from one to ten, where ten is loudest, I would rate these fans at a 5.0/10. This is just too loud for me and I would much rather prefer quieter fans. After having a closer look at the Cooler Master MasterCase H500, I obviously have to eat my words. The H500 has some good features, but also some downsides that really are frustrating to work with. I clearly have to go back on my statement from the older review that 200mm fans have a limited place in the chassis market, considering the excellent airflow they offer in cases that make use of them. From the outside, the Cooler Master MasterCase H500 has great aesthetics with the tempered glass side panel. I also appreciate the shift of using a grey exterior with black only in specific places instead of an entirely black case. The interchangeable front panel is a wonderful addition, and there are adequate dust filters found along the side intake areas should you choose the solid panel. The biggest drawback is the lack of thumbscrews for the tempered glass side panel, which is a minor complaint. The case is well built using steel and plastic. The glass definitely elevates the feel over a standard steel case. Moving on to the interior, it is mostly well designed. There are a few smaller frustrations, as with the hard drive cable routing, but overall the experience is smooth and easy. Again, I would love to see more information in the instruction manual. 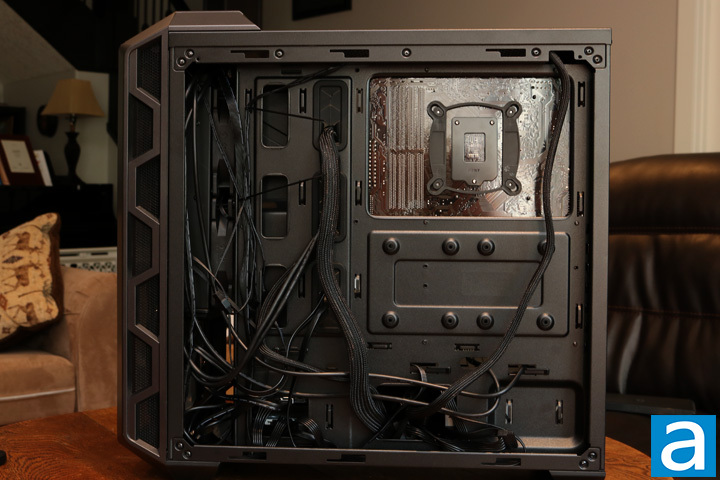 Furthermore, the necessary cable management tools are there to create a polished final look. As well, there are plenty of cooling options to choose from for beginners and enthusiasts alike. The 200mm fans ensure excellent airflow throughout the case, even though it makes mounting radiators slightly more challenging. 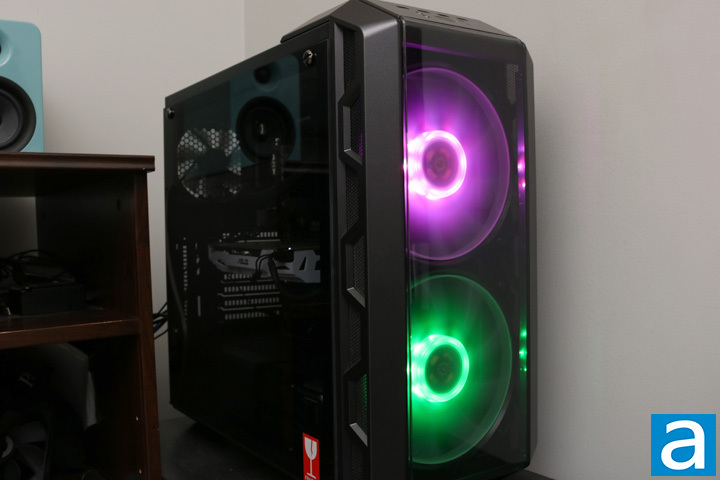 My biggest issue with the MasterCase H500 is the RGB implementation, which has been my complaint with other RGB cases as well. The MasterCase H500 forces one to either sacrifice the reset switch or go through the effort of opening the case and using the RGB controller. Furthermore, I can never be sure which lighting mode is on, since the color changes randomly. My unit is most likely defective, but the colors do not sync up and some colors do not even work on one of the fans. RGB implementation in computer cases need work in general, and the MasterCase H500 is no different. As for the price, the Cooler Master MasterCase H500 comes in at $100 USD, which is about the same as the other RGB cases I have looked at. The price is fair, but I think there are some clear areas that need fixing for a better overall experience. 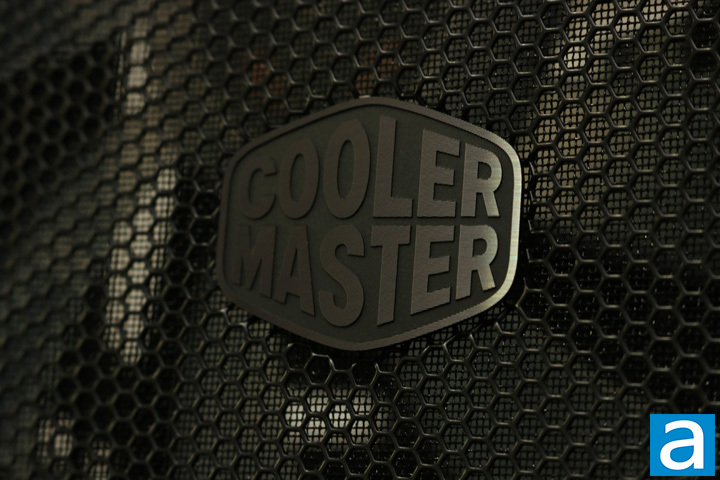 Do you have any comments or questions about the Cooler Master MasterCase H500? Drop by our Forums. Registration is free, and it only takes a minute!